A village is considered electrified, if 10 percent of all the households have electricity and it is also there in the public places like schools, health centers and panchayat bhawan etc. and if we go with this strange criteria close to 35,000 villages are not electrified (as per records of Govt. of India, 2012) out of over 6.00 lakh villages!! the reality – we all know.. even with the best possible connections the life of city people goes on- not always on direct current but because of inverters to the generators. And when all these harsh realities become a little overwhelming.. here’s something to make one feel proud as aam janta janardan or the common masses.. Katara village in district Darang, Assam hadn’t seen electricity right from the time of independence. Over 100 village households had built their lives around living in the dark for decades.. What changed this scenario is a moving story of connecting the dots and filling the gaps In April 2009, a 19 kv generator weighing a few tons was discarded by a Delhi based agency. They casually asked us whether we would have any use for it, even as scrap. This was a new category of material even for us so we started exploring various options around what to do with this mammoth machine. Some repairs later, the generator was restored to working condition but for such a massive machine mobility and optimum use proved to be a bit of a challenge. 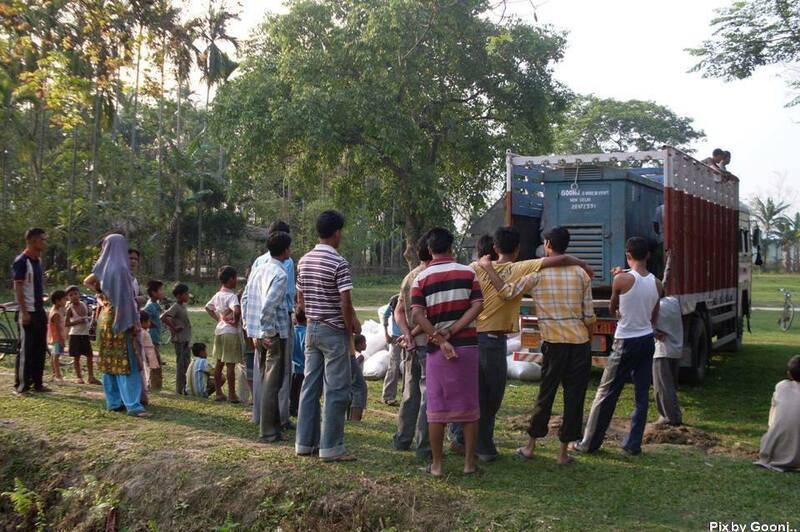 After much consultation this generator was dispatched from Goonj Delhi to Katara, a small tribal village in Assam. Just 60 km from Guwahati (the state capital) this village –like thousands of other villages hadn’t seen electricity even after decades of independence. A crane was used to load the generator on to a truck in Delhi but with little infrastructure in the village, for offloading an elephant was called.. It was a case of one giant picking up the other.. The sight was a bit of a wonder for the villagers who had never seen a machine this big.. Now we are all familiar with power cuts and escalating electricity bills but not having access to electricity is something none of us would want to imagine.. Well.. that’s the sobering reality thousands of villages and lakhs of people wake up to every day. The generator in the village ensured that electric connection was provided to the villagers at a nominal cost of Rs 5 for 2 CFL bulbs from 6:30 pm to 10 pm every day. This money was used to buy the fuel for the generator and soon we found 112 household were connected.. The interesting bit really is about what happened when these people got electricity even if for some hours.. Things started to change dramatically in their lives. The best impact was on children and their education. Deigi Baswmtri a class 9 student from the village said “I am happy that now I can study even after the setting of the sun”. The parents also felt relieved.. Kamal Sargari a father said “it is not possible for me to spend ½ ltr of kerosene everyday on the lamps for my children to study because kerosene is so expensive”. The Census of India (2011) says that close to 43.2% of India’s rural households continue to depend on Kerosene for lighting, while even today 0.5 percent of our population (close to 897,760 households) doesn’t have access to lighting at all. People who earlier spent their day in agricultural pursuits and evenings in darkness, now started to utilize their evening time and energy in a productive way. After returning from fields where they would often work as casual labor, some villagers started to make their traditional handicrafts like bamboo cap or Dhokhna (a traditional dress of Bodo tribe, similar to petty coat) in the evenings. In turn they started making some extra money. People also started opening shops for longer hours. The change was noticed even in small things. Earlier people had to go 4 kms to get their mobile phones charged while paying Rs-5/ for full-charge. Now they could simply do it at home in the evening. Some households even bought television sets and in the evenings the family and their neighbors got together to watch news or just to catch up with each other.. The generator also made the villagers feel empowered to do more for themselves. Under Goonj’s Cloth for Work several activities like road repair, cleaning of drainage system, plantation in school campuses etc were also initiated. After serving the people for more than two years, the generator eventually stopped working. Today the machine may not be there but the impact it had on people’s lives remains. Katara may not be an ideal village but it is electrified now. Generators going defunct in urban India is not unusual.. what perhaps is that a generator considered discard in urban India ended up electrifying a village which had never seen light. Not everyone can give generators but a small and innovative idea of lighting up a household with a solar light or panel can help the people in countless ways.. We have been making some efforts during disasters by reaching solar lights as an important part of our relief and rehab efforts.. This small story is just to convey how the discard can turn around life somewhere far off and how one thing leads to another. All it needed was for some people like you and me to connect the dots.